A day before my Friday roadshows, Long Legs was sharing with me a place that was touted to serve raving porb ribs (排骨) in Klang. It was supposively located near my roadshow outlet. Me, being super cacated and directionally-crippled in Klang, had thought there were no hopes in locating it. Thus, I really must thank my Klang-based colleague, Sharon for bringing me there! Restoran Peng Heong Hakka Pai Kut has an extensive menu. Its pork ribs is certainly the definitive dish there as its ubiquitous presence was on each table. We saw many patrons ordering other dishes such as mutton curry, spicy and sour mustard and vinegar pork trotters as well. Food was served very fast, and the servers were friendly and helpful. The premise was also very clean and comfortable to be in. 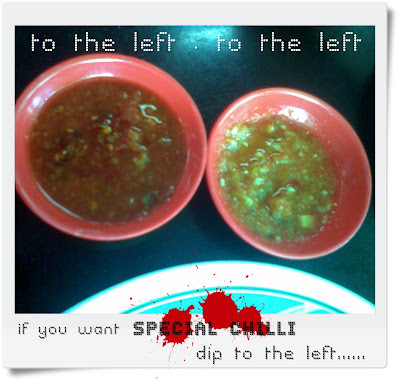 While waiting for the dishes to be served, choose your chilli dips. The redder one on the left was sweet and has a faint piquant taste of something that I'm not sure of, like plum? It could be an acquired taste for some because one of my colleagues didn't touch hers after a taste. The one on the right was the garlic and ginger chilli normally served with chicken rice. Now for the star of the visit! RM 8 worth of carnage here. The meat was well marinated (I could taste ginger or galangal). Deep fried and drenched (or simmered) in a thin sweetish sauce, each morsel was a delight to indulge in. Upon my first bite, I was thinking: This is so soft and tender, it doesn't feel like pork ribs at all (...you know, those annoying ones that gets its meat fibers stuck in your teeth). Now we know why the shop was packed to the brim... worthwhile coming for. 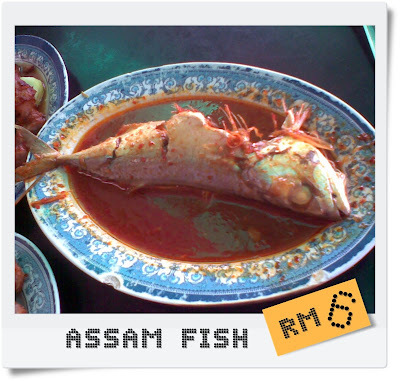 Assam fish is priced by size. You can order it from RM 5 up till RM 8. This fell short of expectation, for me at least. I love my assam fish on the fiery and sourish side. The sauce was too sweet and wasn't spicy enough. My colleagues like it coz it wasn't spicy. I must say, the fish was fresh though. Can taste the subtle sweetness (umami). 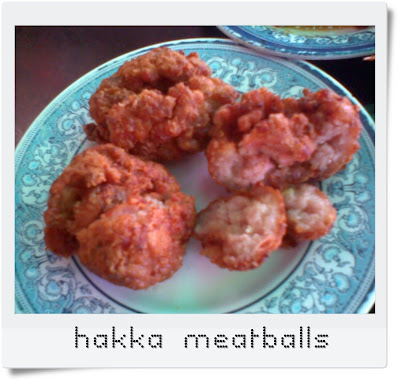 These balls were priced at RM 1 a pop. So RM 3 worth of balls here. Not a shout-out-loud dish. Somehow or rather, it has a taste remniscent of "wu kok" (芋角). Goes well with the special chilli. We also ordered stir fried lettuce for roughage. Lightly stir fried and still retaining its crispness, the vege was only RM 3. They actually had a RM 2 portion too! Dirt cheap. Another must mention is their rice. Oiled rice (油飯) is served here. It was really fragrant, cooked with stock. They have thick and dark soya sauce on the table for you to drizzle your oiled rice with as well. Total damage = RM 24 (inclusive of 4 rice and a drink). Rice was RM 0.50 per bowl. 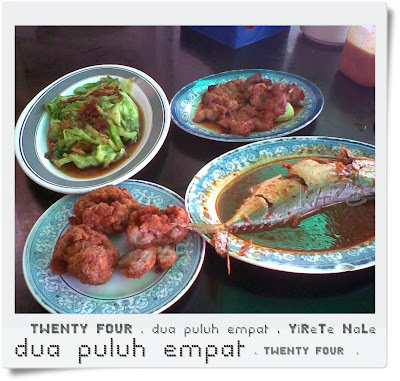 This is a place that I won't mind returning for again as its food is really affordable and delightful. Now, I can't wait to try the other dishes. Happie Sunday, y'all! Helpful tip gleaned from here ---> Road to right is Jalan Pasar where Hai-O & Ayamas is, left is Klang big mosque. Restaurant just behind mosque. Yeah I've been to the roadside stall many times..I didn't know they had moved. everyday i pass by there... i dun even wanna eat there ._.